Accordingly, Hung unleashed a bloodbath. Foreign missionaries declared Hung deluded and his movement a caricature of true Christianity. The Chinese government, which almost perished, and the officials and social elites of central China, where over 20 million died and whole provinces were laid waste from 1850 to 1864, viewed the Taipings as a product of Christianity, pure and simple. The decades from 1860 to the early 1900s were the heyday of the foreign missionaries. Protestant missionaries increased in number from fewer than 100 in 1860 to several thousand soon after 1900, spread over the entire empire (thanks to new political privileges granted by treaties in 1842 and 1860). This was the age of institution building in China missions: schools, from primary through college; hospitals and clinics; translation and publishing. It was a remarkable achievement by a remarkably capable and self-confident generation of missionaries. Yet just below the surface of this “missionary” achievement can be seen the real secret of its success—Chinese Christian partners. Chinese Protestants increased from a paltry few hundred in 1860 to over a quarter million in 1905. Though mission records often omit the names of the Chinese, Chinese Christians played key, though subordinate, roles—in churches, as assistants, preachers, and translators; in rural mission stations, as resident staff where foreign missionaries seldom visited; and in education, medicine, and publishing, where they did most of the day-to-day work. Compared with earlier generations of Chinese Christians, they were better educated (thanks to mission schools) and more prosperous. Many entered business and the professions as well as the pastorate. They had a greater say in their churches. They wanted to hire and pay their own Chinese pastors and to manage their own programs. In Shantung (Shandong) province, for example, Liu Shoushan (1863—1935) came out of abject poverty as son of an opium addict to become a real estate tycoon in the port city of Tsingtao (Qingdao). He was educated in American Presbyterian mission schools, and as his business prospered, he repaid the mission, with interest, every cent spent on his upbringing and education. In later years, he gave large sums to several churches and also funded Christian hospitals, individual Chinese preachers, and Chinese ymca workers. He was also one of the founding elders of the first Shantung church to declare independence from foreign mission control and take charge of its own affairs, in 1912. 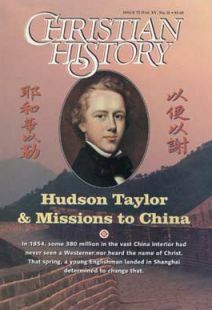 Everything looked positive for the whole Christian enterprise after 1900 as schools, hospitals, relief activities, churches, missionaries, and Chinese Christians were on the rise. Several Chinese Christian leaders began to play visible nationwide roles. Ding Limei, a young pastor from Shantung province, became a powerful evangelist and revival speaker. Later Cheng and other Chinese leaders helped organize the National Christian Conference of 1922, which had a majority of Chinese delegates. In addition, the National Christian Council, an ecumenical standing committee that emerged following the conference, had a majority of Chinese members. This “Sino-Foreign Protestant Establishment” looked like an equal partnership between foreign missions and Chinese Christians. It wasn’t. The missionaries still held the key positions—and the purse strings. Thus some Chinese Christian congregations able to support themselves opted for full independence. This trend accelerated after 1912 because the new national constitution (adopted by the Republic of China after the overthrow of the old Manchu dynasty) contained a religious freedom clause. In and around several major cities, including Peking, Tientsin (Tianjin), and Shanghai, federations of newly independent churches came into being, dropping their previous missionary and denominational labels. New Chinese Protestant movements also emerged, like the True Jesus Church and the Jesus Family, both with Pentecostal characteristics. The “Little Flock” (also called “the Local Church” or “Assembly Hall") of Watchman Nee (Ni Tuosheng) contained eclectic Brethren and Holiness features. All three of these movements are still strong forces in Chinese Christianity today. And Pentecostalism has been characteristic of many of the Chinese indigenous Protestant movements since the 1920s, including much of the “house church” movement in China in recent years. The late 1920s saw political upheaval, the flight of foreigners to the coast and abroad (including over 90 percent of foreign missionaries), the closing of many mission schools and student strikes at others. Chiang Kai—shek’s Nationalist Party won power and reimposed order, and he himself was baptized a Methodist in 1930. But the old sense of missionary confidence was never regained. One-fourth of Protestant foreign missionaries never returned to their posts, and home support for missions nosedived with the onset of the Great Depression. When full-scale war between China and Japan began in 1937, a whirlwind engulfed all Chinese churches and foreign missions. Many missionaries left China between 1937 and 1941. After the attack on Pearl Harbor, the remaining Western missionaries were interned, reducing the missions presence to a few hundred who retreated to West China with the Nationalists. Chinese Christians were thrown into turmoil but also took up more and more responsibility for managing their own affairs. The foreigners who did not return after the 1920s flight had left their responsibilities in the hands of Chinese colleagues. Most of the foreign YMCA secretaries were let go. But under the able and astute leadership of David Yui (Rizhang), longtime general secretary, the “Y” actually increased its membership in the 1930s. The wholly indigenous Christian movements grew rapidly in the late 1920s and 1930s. Leaders of the True Jesus Church blasted foreign pastors as “big sinners” and “big deceivers.” Watchman Nee and other Little Flock spokesmen decried the sins of divisive denominationalism, which they laid at the feet of traditional foreign missions. By the time of the Communist revolution of 1949, these independent groups constituted at least a quarter of Protestant Christians in China. In addition, a group of dynamic Chinese evangelists rose to prominence in the 1930s—including Wang Mingdao, John Sung, and Marcus Cheng, among others. The conservative revivalism of these men left its mark upon Chinese Protestantism. China plunged into civil war in 1946, from which the Communist Party emerged victorious in 1949 to set up a new state, the People’s Republic. It put all Christian bodies, indigenous as well as missionary, under controls and restrictions. Then in the anti-American and anti-foreign atmosphere of the Korean War, remaining missionaries were deported beginning in early 1951. Not all Chinese Christians regretted the departure of the missionaries. Many Christian leaders thought it was high time for the Chinese church to control its own destiny and hoped to do so under the new government. Today they continue to hope and struggle for autonomy under the watchful control of this government. But this chapter of missions is closed for good. Daniel H. Bays is professor of history at the University of Kansas and editor of Christianity in China: The 18th Century to the Present (Stanford University, 1996). The missionaries are forgotten, but the prospects for Chinese Christianity have never looked better.